Being the Nintendo nerd I am, ever since the first Super Smash Bros. I sometimes tried to imagine what it would be like if various characters (video game or otherwise) that weren't playable in any SSB games yet were. 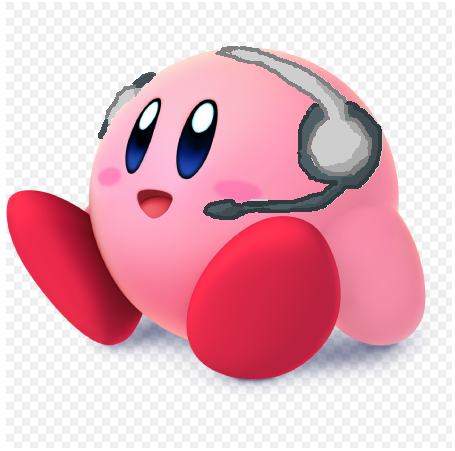 - "What would Kirby look like if he copied this character?" - "What would this character's alternate costumes be?" - (for characters who aren't from a series that's already in the game) "What would this character's series symbol be?" - MAYBE taunts and MAYBE special moves and a Final Smash. And usually I don't write about or draw any of these ideas either - just think about it. But lately, due to my constantly being obsessed with Mary O. (who unfortunately is still obscure enough that I feel like I have to link to that article again), I've been thinking more and more about what it'd be like if she and Yamamura were playable in Super Smash Bros. as a 2-in-1 character similar to Duck Hunt. In fact I first thought of this idea at some point before April Fools' Day 2017 (see the music tag for that entry), but lately I've been thinking more and more about how this could work, enough that I think I have ideas for their entire hypothetical moveset by now. So as I said above, Mary O. & Yamamura would be a 2-in-1 character with Yamamura sitting on Mary O. 's back a lot of the time, like how the duck of Duck Hunt sits on the dog's back most of the time. Mary O. & Yamamura's moveset would mostly be using various elements of the Super Mario Maker interface as weapons - much like how characters like Duck Hunt, Mr. Game & Watch, Wii Fit Trainer, Pac-Man, and Villager use random items from their games as weapons. Standard attack combo: Yamamura pecks, then Mary O. slaps or kicks, then Mary O. pulls out an oversized Wii U stylus and swings it once like a sword. Dash attack: The "erase all" rocket appears underneath Mary O. and she and Yamamura ride it, the way Undodog is seen riding it sometimes in SMM. They have the option to jump off of it midway through, which will make the rocket count as a projectile after that (i.e. it can be reflected or pocketed). Strong up attack: Mary O. swings a key upwards. Strong forward attack: Mary O. pushes a cart with coins in it forward for a bit like in this image from the manual. Unusual in that it's not a dash attack but it acts kind of like one... but a relatively slow one. Strong down attack: First of all, when Mary O. & Yamamura duck, it resembles this image from the manual but a) without the Warp Pipe, b) with Yamamura perched on Mary O. 's back (or possibly head), and c) without Mary O. constantly moving her head, one hand, and one leg back and forth like that. So for their strong down attack, Mary O. does that little kick, and then Yamamura flies up a little and pecks at the air (because anyone hit by the kick will likely end up where Yamamura hits). Up smash: Mary O. swings a hammer overhead, and right before the end of the swing, suddenly a Bill Blaster rises out of the ground so that it gets hit by the hammer. Opponents can be hit by both the hammer and the Bill Blaster, but the Bill Blaster does more damage. Maybe there's a rare chance that the Bullet Bill item spawns when this move is used. Resembles this image but only in the fact that both involve Mary O. hitting a Bill Blaster with a hammer. Forward smash: Mary O. and Yamamura go into one of those trucks from the background of the Coursebot screen and dash forward in it - so, another attack that acts kind of like a dash attack but isn't. Takes a couple of seconds to start up (during which the truck's engine is heard starting), but does a lot of damage if it hits opponents. Neutral aerial: Mary O. pulls out the oversized Wii U stylus and spins it in a circle - kind of like Link's Spin Attack, but weaker and with only one spin, or maybe not even a full spin. At the same time, Yamamura also attacks by flying in a circle in the opposite direction above Mary O. 's head. Up aerial: Mary O. takes her headset off and holds it above her head, and a loud sound effect from Super Mario Maker comes from it (maybe the "WHOO!") and damages anyone close enough. Forward and back aerials: One of them would be Yamamura pecking forward similar to Duck Hunt's aerial attacks; the other would be Yamamura spitting out edamame (you'll have to scroll pretty far down that page). The edamame counts as a projectile, so functionally that attack is similar to Villager's slingshot. Down aerial: Mary O. gets in a giant winged Goomba's Stiletto that flies up for a bit and then ground pounds. The stiletto will be the same color as Mary O. 's own shoes - meaning the default costume will use the Super Mario Bros. version (which it'll always be shaped like regardless of the color), and one of her alternate costumes is specifically designed to make the Goomba's Stiletto resemble the SMB3 version, while another alternate costume has green heels and therefore comes with a Goomba's Stiletto with the color of the non-stiletto Goomba's Shoes. See "Alternate Costumes" below. Grab: Mary O. pulls out a ? Block and a vine emerges from it (so it's similar to Hookshot/Clawshot or Grapple Beam in that it has a long range); the Piranha-Plant-like head of the vine can bite onto opponents and pull them into the block, trapping them inside for a while. It can also bite onto ledges and act as a tether recovery, but a little different in that Mary O. has to climb up the vine manually, the same way fighters can climb ladders on some stages. Pummel (does anyone other than SmashWiki call it that? ): Mary O. puts a sticker that looks like the icon for the punch SFX in Super Mario Maker on the ? Block. Subsequent button presses put multiple identical stickers onto the block. This is unique for a pummel in that it doesn't do any damage immediately, but once the opponent is thrown out of the ? Block (or possibly even if they escape from it without being thrown), the same disembodied cat paw that appears when the punch SFX plays in Super Mario Maker will show up from random angles and attack the opponent once for every punch SFX sticker that was placed on the block. Up throw: Mary O. tosses the ? Block into the air where it stays in place, and then jumps and punches it in typical Mario fashion, launching the opponent out. Forward throw: Mary O. puts the ? Block in a cannon and launches the opponent and the block out seperately; at this point the ? Block will count as a projectile and can be reflected, pocketed, etc. Down throw: Mary O. sets the ? Block on the ground and ground-pounds on it, knocking the opponent out of it. One of Mary O. 's get-up attacks would be a sit-up as a reference to the sit-up men from Mario Paint and how they reappear in Super Mario Maker. A long-range attack inspired by the Gnat Attack minigame from both Super Mario Maker and Mario Paint; it works somewhat like Duck Hunt's Clay Shooting but with a LOT of twists. A gnat will appear out of nowhere near Mary O. & Yamamura and start flying around randomly, and Mary O. will pull out a fly swatter; at that point, pressing the attack or special attack button will make Mary O. warp to wherever the gnat is (even if she ordinarily wouldn't be able to run/jump that far, so if you're lucky enough this can be a recovery move) and swat it - you have to try to do this when an opponent (or target or whatever else you want to attack) is near the gnat so that they get hit too. The gnat can also land on opponents, allies, or even Mary O. herself - whoever it lands on can shake it off by mashing buttons repeatedly. If you press the attack button while the gnat is still flying around, Mary O. swats at it three times - failing to hit it the first two times but always hitting it the third time. So the attack resembles Clay Shooting the most if used when the gnat isn't on anyone. If you press the attack button while the gnat is on an opponent, Mary O. warps to right in front of or behind them and does one powerful attack (about the strength of a smash attack) with the fly swatter, aimed more at the opponent than the gnat - but like a smash attack, it takes a while to wind up, so it won't necessarily hit them. Whether the attack hits or not, the gnat disappears anyway. If you press the attack button while the gnat is on Mary O. herself (or Yamamura but same difference because they share a damage meter)... well, you have to try NOT to do this because Mary O. will hit the gnat anyway and damage herself as a result. If the gnat is on an ally, then even if Team Attack is set to off, Mary O. will attempt the same powerful attack she would if that ally were an opponent. I'm undecided on whether or not this scenario would actually be able to hit the ally (and therefore be something else you'd have to be careful to avoid) if Team Attack is off, but regardless, Mary O. still attempts it. The gnat itself cannot hurt opponents even by landing on them. If Gnat Attack is used in a match with two or more Mary O.s in it (or only one Mary O. plus at least one Kirby that has copied her), no Mary O. (or Kirby) will be distracted by the gnat another Mary O. or Kirby summoned. (Like how one Duck Hunt can't shoot at a can summoned by another Duck Hunt, etc.) In fact, the gnat (and maybe even the fly swatter) will be a different color depending on player port (red for P1, blue for P2, etc.) in case two or more Mary O.s use Gnat Attack at once. A reflector move, but a very unique one. Inspired by the ability to turn certain course elements into different ones in Super Mario Maker by shaking them with the stylus. Mary O. pulls out an oversized Wii U stylus and holds it in front of her (or upward, backward, or downward if you press that direction quickly enough) for a short moment; if the stylus touches any projectile or thrown item, the projectile/item will stick to the stylus (as if it was being dragged in Super Mario Maker) and Mary O. will shake it, turning the projectile into a different projectile or item, and then it'll act as if that projectile/item was reflected by a "normal" reflecting move (unless it ends up being an item that can't be thrown like an Assist Trophy, then it just drops to the ground). Mary O. can also use this on an item that hasn't or can't be thrown (except for Smash Balls), sort of like Villager's Pocket - if that happens the item will similarly be turned into a different item (never a projectile, in this case - and again, never a Smash Ball), and then it'll act like Mary O. picked up that item the usual way - which can be good or bad. Every item or projectile that can be affected by this move (except ones that are already drawn as retro-style sprites like Pac-Man's Bonus Fruit) has its own 8-bit sprite that it'll show up as while it's attached to the stylus. For the Pocket-style usage, the item that replaces the original is selected randomly from all normal items that are enabled (excluding Smash Balls) and items that can spawn on particular stages if the match happens to be on that stage [so if this move is used on Distant Planet, the result might be a Pellet]. For the reflector-style usage, those same items still have a chance of appearing, but so do all projectiles that can be shot by items that are enabled (so if Ray Guns are enabled, the result might be a Ray Gun shot) and all non-Final Smash projectiles that are part of the movesets of characters loaded into memory [e.g. if Samus and Link are in the match, this move could turn one of Link's arrows into a Charge Shot]. Should the Item Shake move turn a non-Pikmin projectile into a Pikmin, the Pikmin will disappear after it attacks instead of following anyone around - much like Kirby's version of Olimar's Pikmin Throw. In the rare event that Olimar throws a Pikmin at Mary O. & Yamamura and they Item Shake it into a different type of Pikmin, though, the Pikmin will go back to following Olimar. If ↑B is pressed while Mary O. & Yamamura are on the ground, a hand cursor appears and drags wings onto Mary O. the same way you can add wings to various enemies/items in Super Mario Maker. As long as the wings remain on, Mary O. gets eight jumps instead of two. The wings will be lost if Mary O. & Yamamura take a certain amount of damage (less than the amount it takes to make Kirby lose a copy ability) or if anyone footstool jumps on them; after that happens there's a certain amount of time Mary O. has to wait before she can put the wings on again. If ↑B is pressed while Mary O. already has the wings and/or the duo are not on the ground and/or Mary O. still has to wait to put the wings on again, a trampoline (that looks like the ones from the New Super Mario Bros. U theme) appears and bounces them into the air - similar to moves like Sonic's Spring Jump, Pac-Man's Pac-Jump, etc., but this trampoline bounces them lower than any other characters' such moves. But! At the top of this bounce, Yamamura grabs onto Mary O. and can carry her for a little bit - like Duck Hunt's Duck Jump except it doesn't last as long. Also, the trampoline will have wings if and only if it appears while Mary O. does not have wings. Apparently in the tutorial in the 3DS version of Super Mario Maker, at some point it comes up that Yamamura sometimes forgets that Mary O. isn't a bird. (And giving her the ability to put wings on her back wouldn't help the matter :P ) So maybe that could be reflected here where there's a rare chance that after the trampoline jump, it'll take Yamamura a second or two to remember to carry Mary O.? Or is this moveset silly enough as it is? Undodog appears for a split second and then disappears; while he's there, he acts as a counter similar to Peach's Toad, except whereas Toad appears in Peach's hands, Undodog instead appears on the ground right in front of Mary O. (so, in that regard he's more similar to Duck Hunt's Wild Gunmen). Or maybe he would be in Mary O. 's hands. I can't decide which would be better. Undodog's counterattack is also very different from Toad's - if he is hit by any non-Final Smash attack, he barks and (assuming the attacker is not invincible) this "undoes" the entire attack. Meaning, both Undodog and the opponent are teleported to wherever the opponent was at the beginning of the countered attack (which more often than not would be where they already are, but if Undodog counters something like Sonic's Spin Dash or Pikachu's Quick Attack or even another Mary O. 's Gnat Attack, they might be warped pretty far), and at the same time, any damage or status effects that any other fighters may have taken by the same attack is undone. Then Undodog counterattacks - the animation for this would probably be similar to one of the Duck Hunt dog's regular attacks. Note that unlike Gnat Attack, at no point does this move teleport Mary O. and Yamamura themselves - just Undodog and any opponent he counters. If the attacker IS invincible, or the attack is a Final Smash, Undodog won't do anything except bark when hit, but this still counts as the attack being countered, so it still prevents Mary O. & Yamamura from taking damage from that one hit. Undodog's counter works the same way whether an attack was a projectile or not. If it was a projectile spawned by a special move like Mario's Fireball, it simply disappears; it it was a thrown item, the concept of "undoing" the move will go so far as to have the opponent suddenly be holding that item again; if it was a projectile fired by an item with limited ammo like the Ray Gun or Super Scope, it actually gets that one shot back. At any point while Undodog is on screen, he may randomly sneeze, but this does not affect gameplay - it's just a Mario Paint reference. Mary O. leaps out of the plane of battle and the hand cursor shows up, but is much larger than usual - and unlike the other times it appears, the player is able to directly control it for a while until the Final Smash is over. Use the left stick or whatever to move the hand and press the attack button to place various Mario enemies/obstacles chosen at random (mostly tough ones like Thwomps, Hammer Bros., Bob-ombs since those are already an item - but no Bowsers or Bowser Jr.s because they are playable characters). Here's some other ideas I thought of for special moves that I eventually decided were less likely to be in their moveset than the ones I listed above. Maybe some of them can be custom special moves if those are still a thing in SSB for Switch. Mr. Eraser: Mary O. holds up Mr. Eraser, who erases any item or non-Final Smash projectile he touches. If this isn't at least a custom special move, maybe Mr. Eraser can instead show up (but not erase items/projectiles) when Mary O. & Yamamura shield. Shell Helmet: Mary O. would put on a Shell Helmet - either the Spiny or Buzzy Beetle version (possibly chosen at random, or there may be a way to select the one you want like Pac-Man's Bonus Fruit or Shulk's Monado Arts) - and it would stay on for a while. The Spiny version damages anyone who tries to footstool jump on her, but fire-based attacks would make the helmet come off quickly; maybe Mary O. even takes more damage from fire attacks with the Spiny helmet on. The Buzzy Beetle version would make Mary O. take less damage from fire attacks, but it'll also allow anyone who tries to footstool jump on her to jump higher than usual. However, I think both versions are ideas that would be much cooler as regular items (or maybe new-Super-Mario-Maker-stage-exclusive items) that any character could use, so I decided I'd rather not give Mary O. & Yamamura any moves that would be mutually exclusive with this. Kirby might not be the only one who can copy opponents this time! When Mary O. & Yamamura use this move, a sprite appears over Mary O. 's head that cycles through all the Costume Mario sprites of all fighters currently loaded in memory that are not Mary O. & Yamamura (unless Mary O. & Yamamura are the ONLY fighter loaded into memory, such as in certain single-player modes or when up against another Mary O. & Yamamura; if this is the case, Mary O. 's own Costume Mario sprite shows up, grayed out, and disappears, and the playable Mary O. makes a disappointed face). Press the special move button again (or get attacked in the middle of the move) to make the current sprite become a Mystery Mushroom that makes whoever gets it temporarily become the character that was selected (but a different color; i.e. if there's a green Link in the match, whoever gets the mushroom might become red Link or blue Link or something). The mushroom falls so that Mary O. & Yamamura are most likely to get it, but another character can still steal it from them. While Mary O. & Yamamura (or whoever takes the Mystery Mushroom from them) are transformed, they can use any of that character's moves or abilities (except for their Final Smash - should they try and use another character's Final Smash, that'll just discard the costume, and then they can use their own Final Smash). In fact, Mary O. could use Mystery Mushroom to become Kirby and, in turn, copy another character - perhaps even becoming Mary O. Kirby Mary O.! However, to balance things out, it'd be pretty easy to lose the costume - taking one hit will cause them to turn back to normal (exactly how much damage/knockback they take from that one hit is calculated before they lose the costume, though), and maybe there's also a limit on how many attacks they can do as another fighter and then they'd automatically lose the costume after that. As unique of an idea this is, there would be a lot of combination questions to address if Mystery Mushrooms were to be in the game in any form. So it's not likely to be any character's special move or even a regular item. But I found the idea so interesting that I had to share it anyway. When Mary O. & Yamamura "dodge", the animation for that is just a hand cursor dragging them out of the plane of battle for a split second and then either back into that same spot or a few feet in front of/behind it. This might make them the only fighter to have a dodge animation that never changes which direction they're facing. Incidentally, in this dodge animation and all other instances where this hand cursor I keep mentioning appears, it resembles the hands from Super Mario Maker except it looks like Mary O. 's own arm, complete with the sleeve changing color depending on the alternate costume instead of always being pink - but it's disembodied instead of extending all the way to the bottom of the screen (except for its Final Smash appearance), so as not to obstruct the battlefield (or end up looking ridiculously long on large stages like Palutena's Temple). Whenever Mary O. & Yamamura are stunned, the music and screen will be distorted like the "dizzy" effect in Super Mario Maker (though as long as there is at least one non-stunned fighter in the match, the only part of the screen that will be distorted is a circle around Mary O. & Yamamura - so I guess that also makes it a bit like how some of Bayonetta's attacks appear to distort space-time around her a little). In fact, the stars that appear around Mario when that effect is used in SMM will even appear around Mary O.! None of this would apply to Ryu stunning her with Focus Attack, though, because that move has a different stun effect with a different animation. When KO'd, sometimes Mary O. says what the Costume Mario version of her says in Super Mario Maker upon falling into a pit (I read a YouTube comment saying that it's Japanese for "Next time, do it the right way please" but don't know if this is true). Other times you'd hear the "ow!" or groaning SFX from Super Mario Maker, which would be kind of amusing because neither of them sound anything like Mary O. 's own voice. The hand cursor drags Mary O. (just Mary O.) onto the stage, and then drags Yamamura onto her. - Mary O. puts on a construction helmet and holds up a hammer, based on her Costume Mario version's appeal pose. - Mary O. pulls out a ? Block and the laughing sound effect from SMM (complete with the mouths) comes from it. - Mary O. feeds Yamamura some edamame. I considered making this one a bit unique in that Mary O. 's part of the animation finishes before Yamamura's does, leading to a couple of seconds when Yamamura will be too busy munching on the edamame to do anything but Mary O. can still move and attack... but I figured if a taunt is going to have a unique attribute, it needs to be a useful one. EDIT: How'd I forget these? - Maybe the flag should have a different emblem on it... The electronic manual icon? Mary O. 's headset? Edamame? The Mario "M" but with the pink/gray colors of Mary O. 's default outfit? I would've drawn my own artwork for them but I was in a hurry because I wanted to get this posted before there's any actual new information about Super Smash Bros. 5. I know that pose for Mary O. looks weird with the flagpole removed, but unfortunately it's one of the only images of her that shows her headset, the front of her vest, AND her shoes well enough for me to edit that to give you a good idea of what these alternate costumes look like. Maybe at some point in the future I'll make this image as I wanted it to look and then edit this entry to use that. Kirby's version of the Gnat Attack move is pretty much the same, and all the same technicalities still apply, plus one more: if he uses it and then loses the copy ability for any reason with the gnat still in play, the gnat disappears. Are you sure it doesn't bore you when I ramble on about Mary O. like this? Or that the Miiverse backup entries don't bore you?